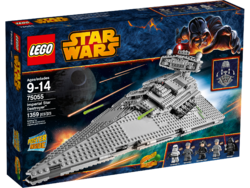 75055 Star Destroyer is a Star Wars set released in 2014. This is a description taken from LEGO.com. Please do not modify it. (visit this item's product page) Get inside one of the Imperial fleet’s most destructive vessels! Experience the power of the Empire! The Imperial Star Destroyer™ is the signature vessel of the Imperial fleet. Turn the rear handle to aim the 8 synchronized cannons and unleash the spring-loaded shooters mounted on the superstructure. Remove the top to reveal the stunningly detailed interior with never-before-seen Emperor Palpatine hologram, rotating chairs for the crew, weapons rack, bridge, control panel and more. Recreate scenes featuring the evil Sith Lord Darth Vader™ from the classic Star Wars movies with this iconic model and use the lifting handle for enhanced play and easy transportation. Play out classic Star Wars scenes with the Dark Lord of the Sith, Darth Vader™! 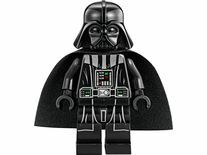 It is the second minifigure scale version of Imperial Star Destroyer to be produced as a set by LEGO. Facts about "75055 Imperial Star Destroyer"
This page was last edited on 2 September 2016, at 22:06.